SOD B® is a dried melon juice concentrate naturally rich in SuperOxide Dismutase (SOD), obtained from a non-GMO proprietary variety of Cantaloup melon. SOD B® is the unique source of bioactive melon SOD worldwide. SOD represents 85 to 90% of the total antioxidant capacity of SOD B®. 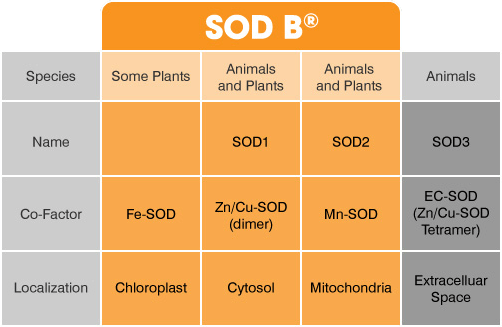 As a concentrate, SOD B® is not pure SOD and also contains secondary antioxidants such as glutathione, carotenoids, co-enzyme Q10 and vitamins C & E.
Unlike other organisms, plants have multiple SOD forms. 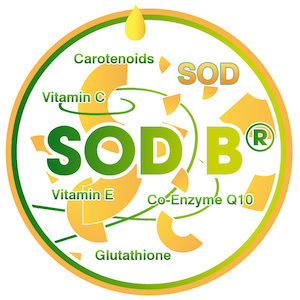 Directly obtained from the pulp of the Bionov unique melon variety, SOD B® provides a unique ratio of the 3 different SOD isoforms existing in plants: Fe-SOD, Cu,Zn-SOD and Mn-SOD. Each SOD isoform of SOD B® requires a specific metal enzymatic co-factor, has a different molecular weight, and allows the elimination of superoxide anion (O2·–) at each site of its production, providing a full antioxidant protection. This ratio has been tested in all Bionov mechanistic, animal and clinical studies. Bionov has confirmed the high SOD activity provided by SOD B® by demonstrating that this active melon concentrate exhibits its highest radical-scavenging activity towards superoxide anions (O2·–). 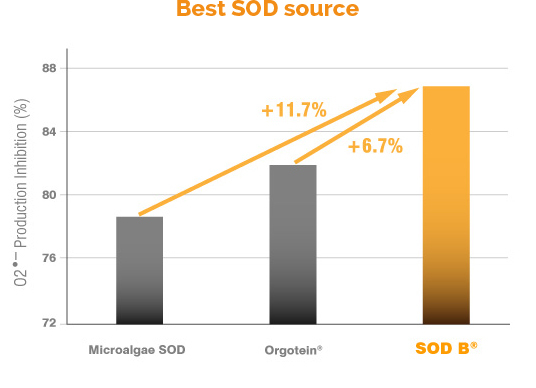 SOD B® has been demonstrated to be the best source of bioactive SOD: at equivalent concentration, the SOD B® antioxidant capacity is 6,7% and 11,7% more efficient than respectively bovine SOD named Orgotein®, and microalgae SOD. 100% bioactive and protected from degradation thanks to a patented microencapsulation technology, SOD B® is scientifically proven to boost the body’s endogenous primary antioxidant defenses. Such a unique mechanism provides antioxidant and anti-inflammatory benefits, which have been highlighted clinically.